If you’ve ever seen the Japanese film Tampopo, you no doubt recall the scene where the elder character teaches his sidekick the fine art of truly appreciating and devouring a good bowl of ramen. Another favourite Japanese restaurant in Vancouver is Kintaro in the West End. Just north of Robson on Denman, the room is very understated. In fact it’s quite unimpressive, yet the crowd of Japanese people lined up out the door will confirm that it’s not why they are there. It’s the tonkastu ramen they want. They need it. The soup is made from giant pots of pork broth with lovely chunks of pork fat floating on top. The cooks work silently and seemlessly with each other to orchestrate the assembly of complicated mixtures of stock, miso, bamboo shoot, sprouts, green onions, boiled egg, corn, spices and wonderful slices of bbq pork. It doesn’t get any better than this friends. Makes you wish you grew up in Japan, eating this every day for lunch. 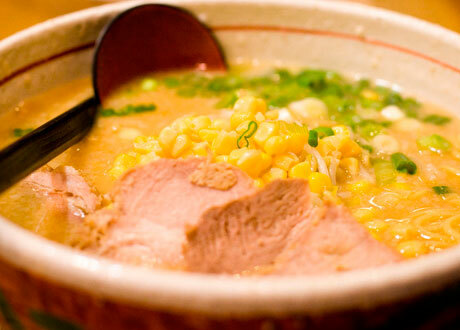 Kintaro Ramen is located at 788 Denman Street, just north of Robson, in Vancouver. Their telephone is (604) 682-7568.